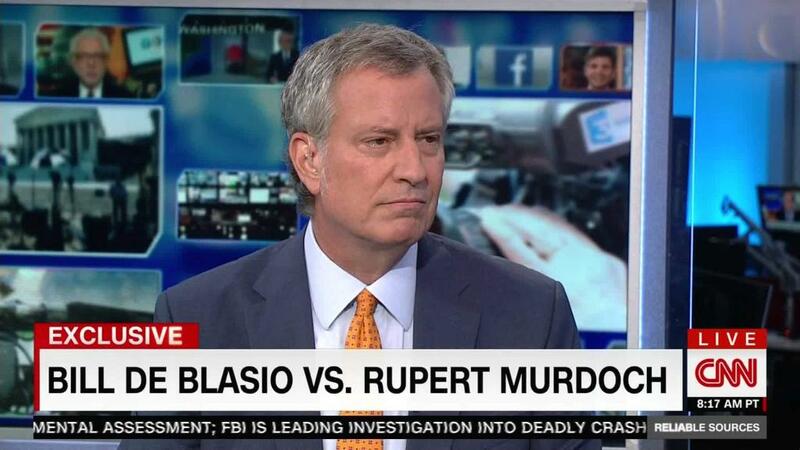 New York City Mayor Bill de Blasio thinks America would be better off if Rupert Murdoch left the news business. De Blasio, a Democrat, said on CNN's "Reliable Sources" Sunday that the news outlets run by Murdoch — including Fox News and The New York Post — "put race front and center, and they try to stir the most negative impulses in this country." De Blasio said he believes that Donald Trump would not have won the presidency if Murdoch-run media businesses, including News Corp and Fox News, never existed. And the country would be "more unified" without those outlets, he said. "There would be less overt hate, there would be less appeal to racial division," he said, echoing comments he made to The Guardian last week. "Reliable Sources" host Brian Stelter challenged de Blasio and said "politicians make lousy media critics." Stelter asserted that the anti-media rhetoric is reminiscent of President Trump's attacks against news outlets. De Blasio insisted his stance on Murdoch's empire is different from Trump's press attacks. The mayor said he is not anti-media and defends News Corp's "right to exist." "I believe in a free, strong media with diverse views. I'll defend it with all I've got," de Blasio said. "But we have to be able to call out when a particular company has a corporate agenda, has a political agenda, and has very effectively changed the American discourse." In response to Stelter's push-back, he argued that Murdoch's outlets are "dividing people and creating hatred and negativity and changing our political landscape for the worse." "I think we have to be able to talk about that," he added. "We have to respect their constitutional rights, of course, but we also are consumers. We're also citizens. If we don't talk about it and they continue to do this to our country, something is wrong." The Murdoch family oversees both News Corp, which operates the Post, and 21st Century Fox, which operates Fox News. A corporate spokesperson did not respond to a request for comment. But one of Fox's popular talk shows, "The Five," recently responded to de Blasio's comments to The Guardian. "He thinks America would be better off without us? What he's really saying is he would be better off without us," co-host Greg Gutfeld said. "But he's wrong. Even without America's most-watched news channel making fun of him, other progressives still shun him. He's 7 feet of political invisibility." Criticism of Murdoch's empire is common on the left, but it's notable to hear a politician like de Blasio speaking out so forcefully. His recent comments may be a way to stand out in a potentially crowded field of 2020 presidential aspirants. In the interview on Sunday, Stelter asked if de Blasio may be mulling a run for the presidency. "I am mayor of New York City, and I will continue to be. My term goes to 2021," de Blasio said.